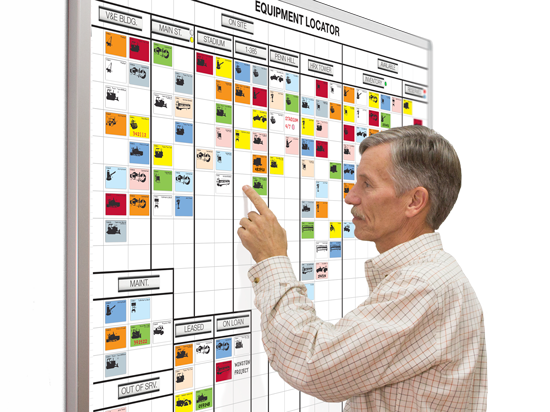 Magnetic dry erase whiteboard system kits to visually track and manage equipment, vehicles, facility and job sites. Equipment management can be almost headache-free when you tackle it with tools that show you what's happening before it becomes a problem. Here are field-proven white board systems for equipment tracking, performance prediction, location, availability, condition, assignment and maintenance tasking. When everyone sees you are fully on top of your maintenance needs, these board systems can produce an anxiety-free smooth efficient workplace environment that goes right to your bottom line.